Get inspired for episode two of the Great British Bake Off with our biscuit recipe suggestions and baking tips for guaranteed success in front of the judges. It’s Biscuit Week in the Great British Bake Off tent and you can almost feel the nation gearing up to don their pinnies and get their rolling pins out. This week sees the eleven remaining contestants tackle mammoth gingerbread houses, draw works of art on simple sounding iced biscuits and see how their piping skills stack up with that old British favourite, the Viennese Whirl. While there will no doubt be a few tears and some soggy, falling apart concoctions presented to the judges during the episode, biscuits are actually really easy to make and a great entry into the technical world of baking. Whether you like them chewy or crisp, sweet or savoury, with chocolate on or plain, there’s a biscuit for everyone. Start with a simple shortbread or ginger snap and when you have mastered the basic technique, try embellishing the recipe. For example, a basic cookie dough can be the base for chocolate chips, chopped nuts, candied peel, dried fruit, oats, desiccated coconut and so much more. 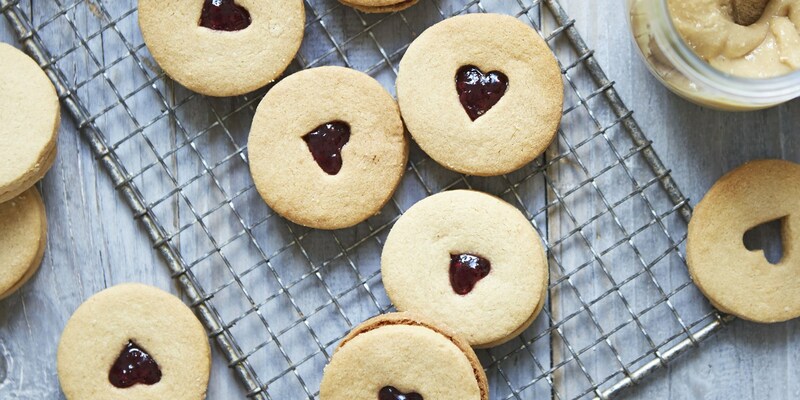 Try making these Peanut butter Jammie Dodgers to see what we mean. Be adventurous with your flavour combinations and don’t be shy of spices – these Cardamom, orange, cranberry and pistachio cantucci are full of flavour and incredibly easy to make. Karen Burns-Booth shows us how to make Viennese Whirls at home, with the delicious raspberry jam and buttercream icing filling – see if your attempt fares better than those in the tent. Iced biscuits are all about the presentation, so if you can make a basic biscuit that’s fairly robust and have good enough hand-eye coordination to draw intricate designs with brightly coloured icings then you’re on the road to success (although the nerves of the contestants will no doubt result in a few shaky hands). Gingerbread houses are one of those projects that are started off with good intentions, but soon become a chore when you realise your structural planning wasn’t quite as sound as it should’ve been. Make sure you draw everything out first, or take an existing design and adapt it to your own pleasing. Simple as they are to make, it is important to get the bake right. To get that all-important snap and an even, golden colour, follow these simple tips. Even Mary and Paul are likely to be impressed with the results. Use a flat baking sheet – this allows the air to circulate for an even, crisp bake. It is easier to slide the biscuits off the tray too. Cook the biscuits in batches – overcrowding the oven will prevent even cooking. Know your oven – if your oven cooks unevenly, turn the tray around during the cooking to ensure an even bake. Judicious use of tin foil will protect darker biscuits from colouring further. Check the biscuits for doneness regularly – the line between underbaked and overbaked is a very fine one. Allow the biscuits to cool on the baking tray for 5 minutes before moving to a cooling rack – this allows the biscuit to firm up before you move them. Allow the biscuits to cool completely before icing so they retain their crunch.